Here’s a mod that a lot of my clients have ordered from me via email. It’s what I recommend every guitarist should have ‘always on’ as the first pedal in the chain after your tuner. 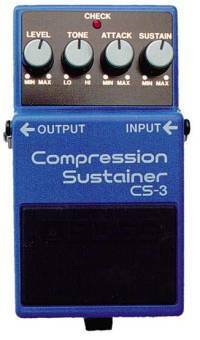 Let’s face it, the CS-3 is a dud out of the box. It was supposed to be an improvement on the CS-2, but like so many ‘new, improved’ things it failed to come up to the bar. But that doesn’t mean you need to get rid of it. The Dexter Mod Wool Press mod cleans up the noisy lo fi sound that is the CS-3. The mod makes the Boss CS-3 compressor deeper and richer with more bass coming through, but not too much, so you get a sound fuller and warmer with a tad more headroom. A number of troublesome electrolytic cap are swapped for higher quality metal film to reduce the annoying background noise as well. The Dexter Mods Wool Press mod turns an unusable pedal into a studio quality piece of kit. This mod includes a WHITE L.E.D instead of stock red L.E.D and a brand new 9 volt battery. Questions are welcome but please check the Dexter Mods FAQ here first. Recorded with a Fender 62 Relic Strat neck pick up, Peavey Classic 50 tube amp on clean channel. Take 1 Clean Fender then stock Boss CS-3 Compression/Sustainer then Dextermods Wool Press modded Boss CS-3 Compression/Sustainer then Monte Allums modded Boss CS-3 Compression/Sustainer. Take 2 Clean Fender then stock Boss CS-3 Compression/Sustainer then Dextermods Wool Press modded Boss CS-3 Compression/Sustainer then Monte Allums modded Boss CS-3 Compression/Sustainer. Excellent. Pedal returned and works great. Sweet trade! fantastic trader, highly recommend to others!!! Freindly trader, excellent communication and very quick delivery. The pedal really cleans up the sound. Buy with confidence!